Underarm sweat or perspiration stains are obvious and embarrassing. Unfortunately, even if you manage to keep your cool next time, the odor and stains can remain in fabric if you don't wash shirts correctly; add just a bit of warmth and the odor comes right back. Armpit stains are caused by the reaction between antiperspirant ingredients and the salts in your sweat. Most antiperspirants contain aluminum compounds to reduce wetness. It is the aluminum that causes the build-up and yellowing on white shirts. The stains don’t appear overnight, but without proper washing after each wearing, the stains will start to look yellow on white shirts. First, be certain that your shirt is washable. If it says dry clean only, believe the tag. Dry clean after each wearing to prevent armpit yellowing. If your shirt is white and washable, there are two methods for removing the yellow stains and stiffness. Success will depend upon how old the stains are and the fabric content of your shirt, cotton whitens best. Solution One: Mix one part baking soda, one part hydrogen peroxide, and one part water. You will need about one-fourth cup of each ingredient to treat one shirt. Rub the solution into stains and allow it to sit for at least 30 minutes. Use an old soft toothbrush or bristle brush to loosen any residue and then wash as usual in warm or cold water. Solution Two: Mix one part oxygen-based bleach (brand names are: OxiClean, Nellie's All Natural Oxygen Brightener, or OXO Brite) and one part household ammonia. DO NOT USE CHLORINE BLEACH with the ammonia as deadly fumes can occur. In a well-ventilated room while wearing rubber gloves, mix about two tablespoons of each ingredient per shirt in a non-metal bowl. Rub the solution into the stains with a soft bristle brush for at least 30 seconds. Allow to work for at least 10 minutes and wash as usual. If you use a less expensive laundry detergent, it may not work well enough to remove the bacteria that embeds in clothes which causes the odor to linger. Baking soda helps regulate the pH level in the washer's water. Adding one-half cup baking soda to each laundry load, will help detergent work more effectively and reduce bacteria. For heavy perspiration odors, use baking soda as a presoak. Dissolve one cup of baking soda in some warm water. Fill the ​washer tub or a large sink with cool water and add the dissolved baking soda. Submerge stinky clothes and allow them to soak overnight and then wash as usual. Wear an undershirt to help protect your more expensive outer shirt. If an extra layer is just not possible, try switching to an aluminum-free deodorant. Read the labels and you’ll find that antiperspirants have varying levels of aluminum compounds. 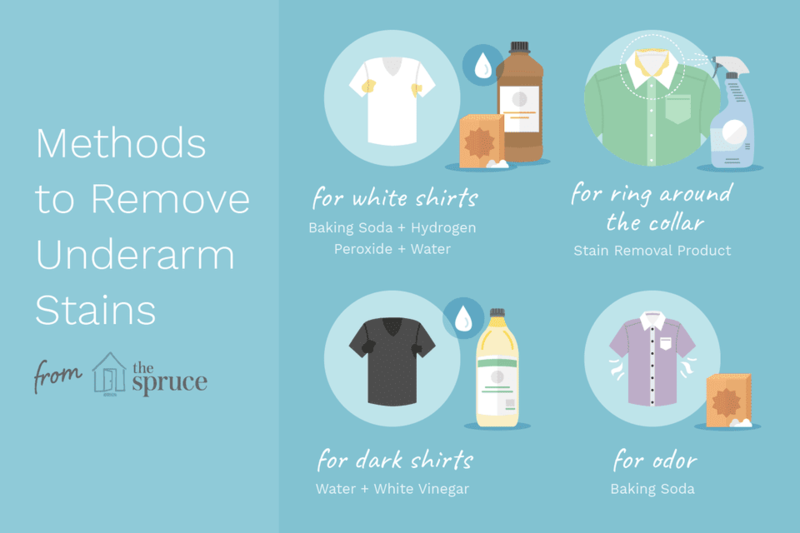 After applying deodorant, allow it to dry before dressing to prevent rub-off on fabrics. If you don’t have time to wait, a couple of blasts of air from a hair dryer to the underarms will do the trick. This will also help with those white zebra stripes on fabric. If you have perspired on a garment, wash or dry clean it as soon as possible. Stains are much harder to remove once they become set in. Keep a spray bottle of undiluted white distilled vinegar handy and spray the underarm areas of both white and colored shirts before washing. Give the vinegar time to work, at least ten or fifteen minutes, before washing as usual. The vinegar will help cut through any deodorant residue and reduce odor. If you notice the beginnings of yellow stains, stop tossing the shirt in the dryer until you can treat the stains. The heat can set in residual stains making them almost impossible to remove. Dry shirts in the sun to increase whitening of fabrics and if that’s not possible, air dry indoors. Underarm stains are very evident on white shirts because the fabric turns yellow. While they may not be as apparent on dark colored shirts, they are there. The underarm stains from deodorant and body soil trap bacteria, cause odor, stiffness, and discoloration of the fabric. To remove the build-up and freshen a washable colored shirt, fill a washing machine or large bucket with cool water and add one cup white distilled vinegar. Allow the shirts to soak for at least 30 minutes. Drain vinegar water and wash as usual in cool water. If the build-up is really heavy, mix a one-to-one solution of white distilled vinegar and water and use an old toothbrush to scrub the area before soaking. Ring around the collar or cuffs is caused by a combination of sweat, body oil, and daily soil. The key to keeping collars clean is to tackle the oily stains after every shirt wearing. Since the stain is oil-based with trapped soil, stains should be pretreated using a solvent-based stain removal product. Stain sticks are particularly convenient for collars and cuffs. Or you can use a laundry soap bar like Fels-Naptha or Zote. If you don't have a solvent-based pretreater, apply heavy-duty liquid detergent like Tide or Persil to the stain and work it in by gently rubbing. Allow the pretreater to work at least ten minutes before washing. The pretreatment should be done as soon as possible after wearing the shirt. Keep a stain remover or laundry soap bar near the dirty clothes hamper. Just a quick swipe will get the process started and make the stain removal easier. After treating, wash the shirt as usual in the hottest water appropriate for the fabric using the recommended amount of heavy-duty detergent. Inspect the garment before drying at high heat and repeat treatment if necessary.